I don't want to over-state my irritation here: Domaine Olivier Hillaire makes a fine Châteauneuf-du-Pape and an excellent Côtes du Rhône, the subject of today's tasting inquiry. "From vines located just across the Rhône River from Châteauneuf-du-Pape." Uh huh. Back in my snarky youth, we used to have a saying, "'Close' only counts with horseshoes and H-bombs." Otherwise, as another old saying goes, a miss is as good as a mile. Generally, a miss literally is a mile when it comes to wine appellations. To liken Châteauneuf-du-Pape, with its favored location and the characteristic large, oval "pierres roulez" ("rolled stones") that fill its vineyard soil and act as natural solar heat, to the simpler soils of the generic Côtes du Rhône on the other side of the broad Rhône, would be something like claiming that my old apartment in Astoria, Queens was just like a pied a terre across the East River on Manhattan's wealthy Upper East Side. The moral of this story is simple: Don't trust anything on a wine label that isn't required to be there by law or regulation, and it might not hurt to be skeptical even of that. Still, I love the Southern Rhône and all its wines - including food-friendly and delicious red Côtes du Rhône. I guess I don't begrudge Olivier Hillaire a little resume inflation. But please don't buy this wine thinking it's something that it's not. My tasting notes are below. Bring out your Barolos and Barbarescos for the WineLovers Discussion Group's Wine Focus this month, and that's not all! We'll consider all the wines of Piemonte ("foothills"), the large, diverse region that makes up much of northwestern Italy's shoulder where it butts up against Alpine France and a bit of Switzerland. You're warmly invited to join our wine enthustiasts as we feature "the Wines of Piemonte." Piemonte may be best known for those two powerful, ageworthy and often expensive "B" reds made from the great Nebbiolo grape; but there's much more here, and we're open to it all this month, from Barolo and Barbaresco through Spanna, Barbera, Dolcetto, even Freisa, and the sweet and often fizzy whites, Moscato and more. Whatever's your pleasure from Piemonte, bring it, and bring your comments and questions, and we'll hope for an active month filled with good conversation and tasting reports. The discussion topic begins here. * Two award-winning wines, beautifully wrapped in the colors of the season. * Bonus Gifts: Beautiful wine country note cards and a $25 Wine Credit. FOOD MATCH: Côtes du Rhône makes a natural match with beef or sharp cheese, but it's also fun to venture into more offbeat territory. I was delighted, for example, at its affinity for my smoky, fresh-made baba ganoush, made with local eggplants smoked over charcoal and hickory chunks, served with tomatoes and lettuce and Iranian flatbread. WHEN TO DRINK: Côtes du Rhône is made to enjoy, not for cellaring. It won't hurt to keep it a year or three on the wine rack, but it's really best bought, drunk up, and replaced with the next vintage down the line. VALUE: The mid-teens range seems fair, but note that Wine-Searcher.com reports a U.S. median retail price of $14, so it may be worth shopping around. Click here for an importer's info page on Olivier Hillaire, with an interesting video (French, with English subtitles) as well as a link to download a tech sheet (PDF) on the Côtes du Rhône Vielles Vignes. 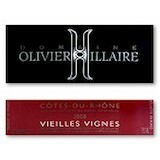 Check prices and locate vendors for Olivier Hillaire 2011 Côtes du Rhône Vielles Vignes on Wine-Searcher.com.